Butterflies surrounding the escalators at Neiman Marcus resemble fall foliage as Vanessa Earle peeks through their wings. She's wearing a muted silver dress by Rebecca Taylor ($295). Festivities marking the chain's 100th anniversary take place this month and next. Imagine celebrating a birthday and having the coolest people show up bearing gifts. That's what it's like at Neiman Marcus as its 100th anniversary approaches. Anyone who's anyone in the realms of fashion, beauty and home style have come up with exclusive items to celebrate the occasion. These are a few of the hundreds of special products being launched as part of the Neiman Marcus birthday celebration. The retailing giant marks the anniversary beginning Monday with five days of product launches, each item marked with an acid green butterfly tag. These range from specially formulated cosmetics like Orlane's Creme Royale ($700), made with 24K gold; to a YSL ostrich handbag ($5,900); as well as shoes and apparel by a who's who list of designers. Monday will also be cookie day, when shoppers will receive a signature chocolate chip cookie, along with the recipe, while supplies last. Shoppers may also sign the guest book, sharing experiences of any NM store. Bring in your favorite NM memorabilia to Customer Service, Level Two, and you could win 100,000 bonus InCircle points, a customer loyalty program, to apply to items in NM's 2007 Wish Book. The week's highlight is the NM 100th Anniversary Luncheon and Fashion Presentation, taking place at noon Wednesday at the Mariposa restaurant to benefit the Rehabilitation Hospital of the Pacific. Cost is $100; reservations necessary. Call 566-3451. The biggest celebration will take place Wednesday in Dallas, where NM was founded by Herbert Marcus Sr., his sister Carrie Marcus Neiman and her husband, A.L. Neiman. The three entrepreneurs had the option of investing in a new bottled drink, Coca-Cola, but it sounded riskier than creating a specialty store that would introduce fashion, quality and service to a ready-to-wear market at a time when women with money had all their clothing custom made only once or twice a year. The concept caught on, and despite a fire that destroyed the original store and all its inventory, the store has survived and thrived, bringing us designs by the likes of Roberto Cavalli, Dolce & Gabbana and Diane Von Furstenberg, that we would otherwise only see in photos of models and Paris Hilton. Zoe Morrison is ready for cool weather in a 3.1 Phillip Lim self-belted sweater ($450) and Alice+Olivia pants ($297). She carries a Marc Jacobs calfskin "Stam" handbag bearing a plaque commemorating NM's 100th anniversary ($1,800). 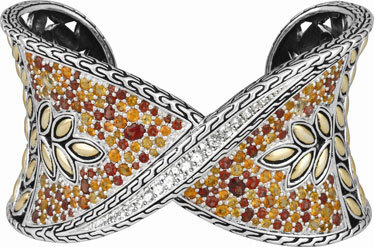 John Hardy created this Sunset colorway and white sapphire-accent twist cuff ($3,000) in celebration of Neiman Marcus's 100th anniversary. The coming of the fall season provides incentive to say goodbye to the summer fashion slump and clean yourself up again. » Today: Beauty Event through Sept. 16 features makeup trends and new products. Receive a metallic totebag with cosmetic samples with a fragrance or cosmetic purchase of $100 or more. » Saturday: Marc by Marc Jacobs event, 4 to 6 p.m. in Contemporary Sportswear, Level One. View shoe, handbag and ready-to-wear arrivals with informal modeling. » Sept. 14: The Front Row features informal modeling of trends of the season, on all floors; 11 a.m. to 2 p.m. Repeats Sept. 15, 21 and 22. 1. Jackets with sleeve details: Designers have played with length and shape of jackets over the past few seasons; now they've turned their attention to sleeves, which are pleated, cuffed or studded with big bold buttons to increase the drama quotient of this wardrobe basic. 2. Exotic handbags: Yeah, we know, you don't like touching snakes. Get used to it. Python and anaconda, along with alligator and crocodile are the latest in luxury handbags. At the lower end of the market, you'll see leather stamped to resemble the real thing. 3. Gray rules: Every fall brings a new black and this year it's a muted version of the color. Gray is just as sophisticated as black, but less severe. 4. Knits: Designed to keep you cozy when it's chilly outside, there's nothing stodgy about modern tops and tunics worn over long-sleeve blouses with high boots. 5. Leather jackets: This wardrobe essential is tailored to the body to fit like inner wear. Keep the silhouette with a pencil skirt or elongate the look with wide-legged pants. Men will need cuff links for their French cuff shirts. Adam Jung wears Brioni ($495) accentuated by Paul Smith cuff links ($108). Sleeve details on a Cynthia Steffe silver leather jacket ($635) worn by Vanessa Earle are a key trend for fall. Her sunglasses are from Oliver Peoples. Simple dress shapes also abound, as exemplified by the sheath worn by Zoe Morrison, from Diane Von Furstenberg ($325). 6. Wide-legged pants: These trousers mark a departure from past seasons, so may take a while to adopt. It looks like you have to have giraffe legs to wear them. 7. Booties: Not a full boot, not a shoe; flirty ankle-high booties are not just for kids and are guaranteed to put a kick in your step. 8. Sequins: Any time is fine to sparkle. Sequins can be found on the usual suspects, evening gowns and wraps, but also see the light of day on tank tops offering a hint of shine when worn under a day suit. 9. Sheath dresses: This sleek, straight and narrow nod to a 1960s mod look puts all the focus on your features. You have to have confidence to play it this straight. 10. Cuff jewelry: Costume or real, your best accessory will be a dramatic cuff bracelet, whether studded with Swarovski crystals, precious or semi-precious gemstones. Exotic skins are a key trend in accessories and Abby Royce carries a Nancy Gonzalez green crocodile satchel ($3,250) while adopting a city-sleek look in a Marni 3/4-sleeve leather jacket ($1,380) worn over a Piazza Sempione puff-sleeve, white cotton blouse ($460) and 3.1 Phillip Lim gray wool skirt with black grosgrain ribbon detail ($340). The Tom Ford sunglasses are $310. Vanessa Earle carries a Nancy Gonzalez crocodile clutch ($1,350) while wearing a See by Chloe sweater dress ($530) and Badgley Mischka Couture cuff ($250). 1. Two-button jackets: This is one of the most flattering jackets you can find. Clean and classic, it lengthens a man's frame, and is particularly well-suited for those with short torsos. 2. Evening: Men are allowed to preen as much as women when heading to holiday events, in designer shirts and jackets bearing surface sheen and patterns. 3. 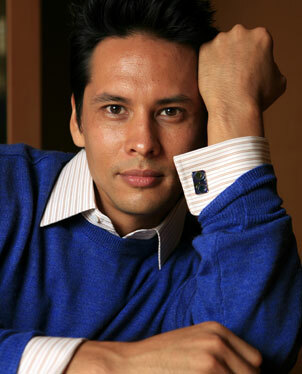 French cuffs: These dressy shirts call for one more piece of jewelry, the cufflink. Make it count. 4. Suede shoes: No they don't have to be blue, but these will add a little variety to your choices. 5. Quilted outerwear: Maybe the puffy look is not for Hawaii, but you'll see it popping up on your TV screens in a mix of patterns and colors, even metallic fabrics. 6. Status bags: No longer just a man bag or nylon messenger, new satchels rival women's handbags in use of supple, high-quality leather for toting all the notes and gadgets you need on the road. Can't wait to see everyone decked out. Black is still a fall staple, day and night. Sherry Wong wears a Giorgio Armani NM Exclusive beaded and embroidered black polyester-satin knee-length dress ($10,100) accessorized with Giorgio Armani black crocheted beaded sleeve ($950).